Above left: Rosina Mahlangu is wearing a floral blazer from Rikochet Resale in Westboro, and her dress is from Forever 21. Her jewellery was bought in Barbados, and her shoes were purchased in Toronto. 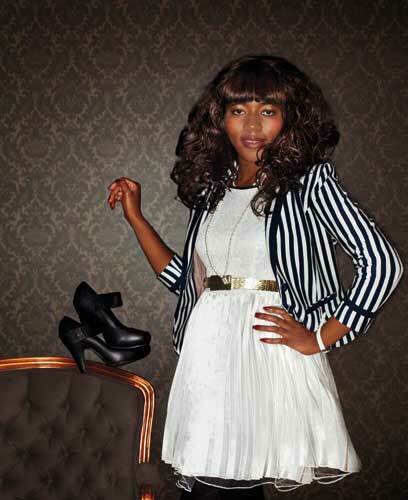 Above right: Mahlangu sports a pinstripe blazer from H&M and a white pleated Moon Collection dress from Milk Boutique. Her vintage jewellery is from St. Vincent de Paul, and the black shoes she purchased in Toronto. Photography by Lucyna Bakowska. Originally from Zimbabwe, you grew up in Toronto. What made you decide to establish yourself in Ottawa?